Mother’s day is right around the corner and like any parent, having a healthy pet is top of the list next to receiving excellent gifts and going on a date. Our furry friends only deserve the best but sometimes don’t get what they need from regular diet and exercise. Even though we want the best for them, our furry friends can still sometimes contract viruses like Parvo or are overactive and have heat strokes. If you are a worried dog parent and want a great backup plan for unexpected issues your pet might have, then Bullyade is here to help! 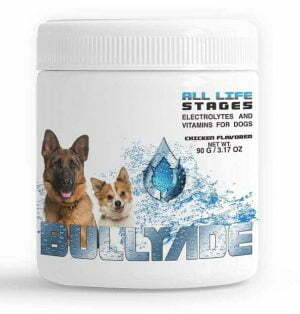 Bullyade is a revolutionary product that is hydrating furry friends across the world. 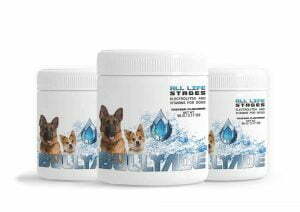 Studies have shown that Bullyade helps prevent heat stroke, help pets recover from the parvo virus, reduces the effects of diarrhea, helps with red blood cell development, and much more! Its the first ever multi-vitamin designed with pets in mind. Its packed full of electrolytes and is great for any animal that enjoys chicken or beef flavors. HOW MANY ML’S DOES MY DOG NEED DAILY? Most pets require “60 mL per kg of bodyweight” (Source 1) in water daily, but even with correct drinking habits, our pets can still become dehydrated quickly. Checking if their gums are moist and pink is a clear sign they are well-hydrated, but when they turn dry and tacky, that’s a good indicator they are becoming dehydrated. Another way to check is to pull the fur on the back of their neck, and if it goes back to place slowly (Source 1), then they are also dehydrated and should see a veterinarian quickly! WHAT TYPES OF PETS CAN BENEFIT FROM BULLYADE? 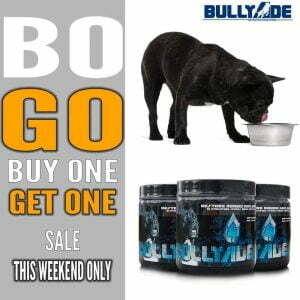 Bullyade is perfect for any pet! It is a powder-based formula that allows dog owners to change the flavor of their pets water by just adding the powder directly to their drinking water and mixing it, then just pour it into their bowl. It’s great for older dogs who have trouble swallowing pills or picky dogs who hate the taste of a vitamins. You can take Bullyade anywhere and add it directly onto their food even if your pet isn’t thirsty. Every pet can benefit from adding more vitamins to their diet and Bullyade makes it easier than ever! We created this product right here in the United States because we believe in providing a safe supplement that helps our favorite friends stay hydrated through hot summer days and keeps them active and healthy. Summer is right around the corner, and we can think of no better gift to give them peace of mind. Whether your furry friend is young or old, picky or just hates medication, we believe Bullyade is the perfect product to keep your pet healthy and hydrated with a tasty treat full of electrolytes!